Caveat emptor: If you're looking to buy merchandise online, be aware that boxes may contain items only similar to the correct ones, or not even close, or possibly even from other manufacturers. Some sellers don't bother to verify the contents; some don't know what to look for; and a few deliberately stuff boxes with the wrong products. (Ask me how I know this.) If you're the slightest bit uncertain, examine the contents carefully, request additional photos if necessary, and compare them to those shown on this website before making a purchase. I've always avoided the topic of prices simply because there are no hard and fast guidelines, especially since Postage Stamp collectors are relatively few in number. Furthermore, consider the following circumstances: While it is true that most of the products are out of production, they came from manufacturers who have supplied multiple importers for decades, and the market is essentially saturated with fifty-year-old merchandise of low-to-average quality by today's standards. Since the products themselves are not unique, the only thing of any real of value to the Postage Stamp collector is actually the packaging. Train sets are likely the most highly prized items, but not consistently: I've seen sets in good condition go for as little as $50, while boxes of junk rake in triple that or more. Probably the only thing that might be considered truly valuable would be a completely sealed set, where the cellophane around the whole outside of the box is intact, which is indeed rare—I've only ever seen one in the last 15 years. Be aware, however, that it's merely the cellophane that gives it so much value, and then only in the currency of bragging rights. In the end, it's really up to the individual how valuable a given item is to them personally. One other important thing that affects value—perceived or otherwise—is the fact that these are 50 year old toy trains, not treasured heirlooms. Some items are difficult to find in mint condition owing to manufacturing issues. 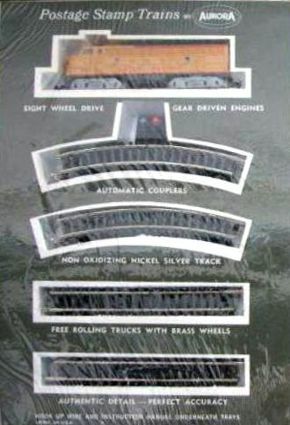 Baltimore & Ohio locomotives (above) are among the rarest: the light grey paint chips easily, and the gold printing fades and turns black or wears off over time. Union Pacific comes in second for similar reasons: the dark grey paint tends to flake off. Then comes Santa Fe, where the decals often turn yellow, and the silver paint gets dull and tarnished. Pennsylvania and Penn Central locos fare the best, since their schemes are very simple. So, while Penn Central locos are a dime a dozen, B&O locos in pristine condition are something special. 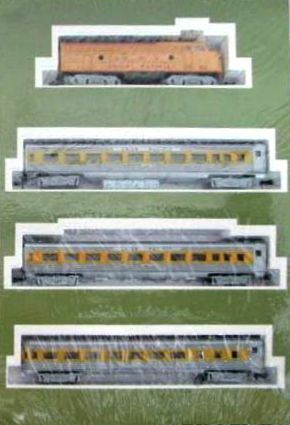 Certain train sets are harder to find than others for reasons unknown, such as Union Pacific passenger sets. 1968 sets in anything but Santa Fe and Penn Central are quite scarce, as these were released capriciously. And the most scarce sets of all are Canadian. Now, if you really want to delve into the very rarest of the rare, then you'll want to find an Aurora Authorized Train Service Station Kit or a bottle of special oil. Good luck with that! Also, certain accessories, such as Special Oil, are nearly impossible to find. Then there are a few one-of-a-kind items like demo layouts; I know the fellow who owns them, so there's no use looking. Some folks go a little wacko selling what they believe are super-collectible items. Recently I saw a 1967 catalog listed for a whopping $95, plus $9.00 just for shipping (I got mine for $10 total, same condition). If you're willing to part with that much scratch for such things, more power to you. But don't complain if you can't resell them for anything but a fraction of what you'd paid. As I've said before, it's challenging—not to mention pointless—to assign hard values to items; it's down to the collector to come up with a meaningful dollar amount. Consider: If I published estimated dollar amounts, I'd receive no end of complaints from people who failed to make the claimed amounts in their auctions. And I could wind up being accused of influencing the market. So, follow your nose, sally forth and collect. Although this was written about plastic kit boxes, it's equally applicable to Postage Stamp items such as the trays. It should help you avoid being scammed by claims of being "factory sealed." 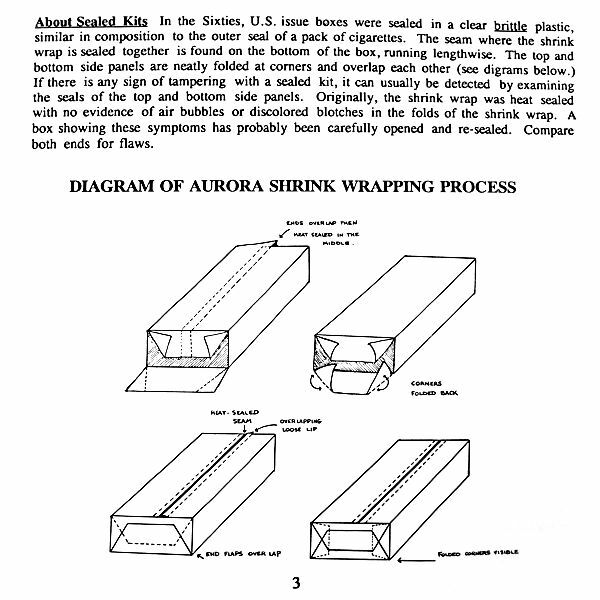 It appeared in the Aurora History and Price Guide by Bill Briegman. If you don't understand what you're selling, find out what you need to know at this website. I've documented everything I could possibly find about every Postage Stamp Trains product. If there's something I've missed or gotten wrong, or if there's a specific detail you need to know that's not covered, please let me know!